If you want to build affiliation (a sense of belonging) and agency (a sense of being able to act in one’s own learning) then amplifying your feedback channels is a great place to focus. The term ‘feedback’ is used in a number of ways and can include references to written and oral feedback, to feedback given and/or feedback received. Feedback is also used to describe reflections on learning and pointers towards next steps in learning aka ‘feedforward’. So if you want to develop your thinking around the topic of feedback, research all of these versions to make sure you access some of the amazing resources, thinking and reflections on the world of feedback. In John Hattie’s most frequently cited research from ‘Visible Learning’ effective feedback systems that are implemented during and between lessons registers as one of the ‘top ten’ most powerful influences on learning progression. Again, if you want to look into this in a bit more detail, undertake some research of your own and I would recommend running searches on Hattie himself and Geoff Petty. You’d also be wise to refresh your memory of the original work of Dylan Wiliam on Assessment for Learning in his book, ‘Inside the Black Box’ and the really powerful publications that followed this work . But don’t stop there as there are many amazing teachers who have looked very deeply into ways to give and ways to elicit feedback and have blogged about their experiences and shared resources that you may wish to test out. Feedback in Hattie’s terms emphasises the process of teachers receiving feedback. As is the nature of Marginal Learning Gains, there is overlap here with quite a few of other MLGs and ‘Being an Error-Seeker’ is one in particular. The process of receiving feedback during lessons is akin to tuning into a radio station. The first thing we need to do to be able to find the channel or station we want to listen is to BE QUIET. When we do so, we can take active steps to amplify the ‘learning channel’ that we really need to hear from as the lesson progresses. Ideal times to do this is when setting up collaborative activities. It is vital that we find ways to stand back and LISTEN. Easier said than done, however. Often, teachers report that they feel guilty if they’re ‘not doing anything’ once collaborative activities are underway. So here are a few practical ideas designed to ease that guilt and give teachers something ‘to do’. 1. This can be captured on short-term bursts by using mini-whiteboards or a creating a template where you ask students to ‘STORYBOARD MY LEARNING’. 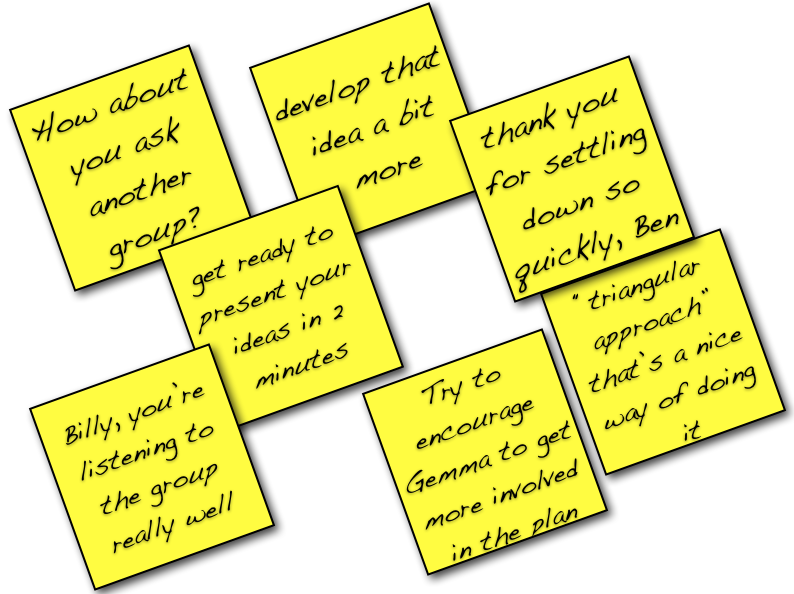 Here, simply ask pupils to record key learning moments they have OR that their partner/ group has had on a sticky note and place it on a timeline for the lesson or for a series of lessons. 2. 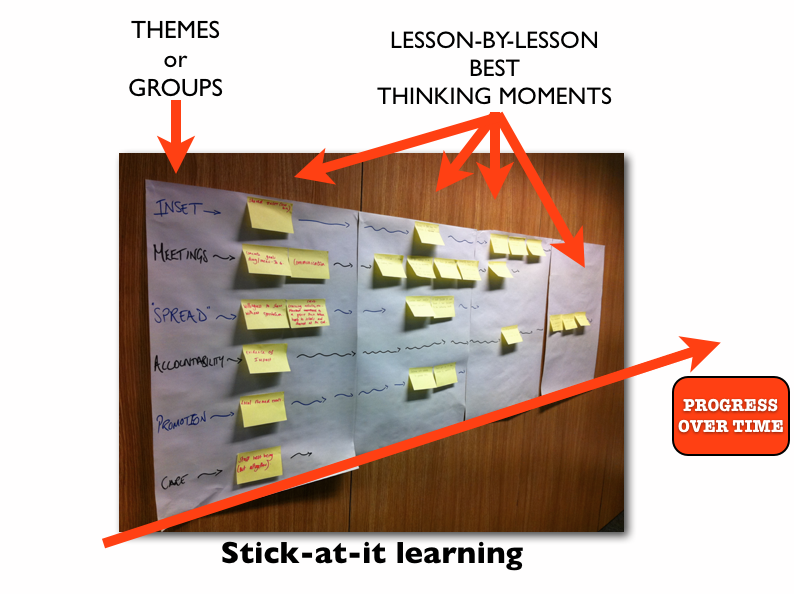 For deliberate reflection moments, invite them to organise the thinking under themes (great ideas/ confusions/ WOW moments etc) to identify their ‘BEST THINKING SO FAR’ or ‘BEST LEARNING MOMENTS’ on the board or wall to reflect upon at any given moment during the lesson. This can be converted into a FAQ board where you ask students to see if they can help sort out each others’ confusions, pose additional questions or lead into a full on critique session…just from setting up one feedback wall that makes the learning visible. 3.A further development of this is to encourage pupils to assess and reflect on their own or each others’ progress against learning goals they have set for themselves (agency) and to highlight key learning moments to learn from them and use them in the next phase of learning. 4. As this is happening, you can stand back, observe, listen and make your own notes on the quality of thinking you hear. You can post your own post-its on the wall to make teaching visible. You can then adapt the lesson design in response to what you read and hear, without interrupting the flow of the learning as it is happening. 5. If you keep the wall up (digital or physical versions) as a record over time, students can trace the progress of their thinking and ideas to connect series of lessons together. If physical space is an issue, students can take photos / record in planners / keep reflective journals / exercise books to record the ideas and document (and value) their ‘best thinking’ over time. This can become the basis of a regular quality learning conversation that deliberately increases a sense of agency because students can SEE their learning and thinking as it develops. Achievements and breakthroughs, however small, are captured and can be be referred to help students build their levels of resilience and independence, have high expectations of themselves and embrace challenge. 1. As students are thinking, discussing, writing, read their work over their shoulder, stand just back from their groups, close enough that you can hear but not too close that they become too aware of you and listen, read and make on-the-spot comments, or clarification, recommendation and/ or probing questions on a post-it note and place it on the students’ desk as you walk by. Once they get used to this, they can draw upon the feedback you have given when they are ready (agency, autonomy & independence) rather than having to pause their thinking to respond to your interruption. 2. If you are working with larger groups or involved in a longer term project where you students learn together in teams, you can appoint a ‘feedback monitor’ to collect feedback comments for the group during the activity. In this way, you can make sure that every group receives feedback from you (or from other groups following a critique session) during the lessons, thereby building affiliation. Feedback might be question-focused, as mentioned above, or be observational focused where you focus on providing EFFORT-focused feedback as part of developing a learning culture which encourages GROWTH MINDSETS. Read some of the work of Dr Carol Dweck if you’re interested in deliberately developing this as part of your LANGUAGE of FEEDBACK. 3. For a fantastic resource on ORAL FEEDBACK, read this brilliant, ideas-packed post from @huntingEnglish. I strongly recommend that you follow him on Twitter and subscribe to his highly reflective blog. When we start to exploit the massive potential of feedback, we are able to amplify the learning channels that we really need to listen to so we can respond to exactly who is coming up with fantastic and surprising ideas, who is asking great questions and who hasn’t quite grasped the concept yet. By operating in such an unobtrusive way, we allow the flow of learning to run uninterrupted and students are required to drive their own learning, thereby building a sense of agency. Teaching then becomes an activity where learning intelligence is collected from around the room. It is both fascinating and hard work to observe and respond to learning in this way and when we’re doing it properly, there’s no chance of feeling that we’re not ‘doing anything’. Not only that, but when we tell students what our role is, they know they’re expected to get on with the learning for themselves. Because we have our job to do, they have their job to get on with and you end up with a truly collaborative and highly motivated ‘3 A’s’ learning environment anchored by the pillars of affiliation, agency and autonomy. We get to hear and observe the learning as it happens and notice some of those students who are often lost in whole-group activities or overwhelmed in one-to-one interactions with an adult. This intelligence can be used to directly and immediately respond, adapt and tweak our lesson design in response to everything we hear, see and feel. This sophisticated level of gathering learning intelligence is nigh-on impossible with a teaching model where the ‘learner-channel’ is drowned out by the ‘teacher-channel’. This entry was posted in Affiliation, Agency. Bookmark the permalink.